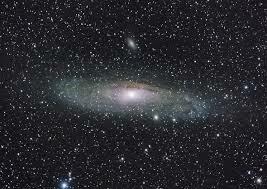 The Universe research papers on the scientific view of the universe using astronomy and physics. The Big Bang Theory has long been held as the most rational explanation as to the origin of the universe. In explaining the beginnings of the universe, the theory describes “how” the cosmos evolved but does little to explain “why”. Generally, it is not the duty of science to explain the why, merely reveal to man the how of universal truths. Thus, the Big Bang Theory describes how the universe expanded through a period of inflation which cumulated in a massive release of pressure and temperature and began the formation of the galaxies as we understand them to be today. Man has tried to understand the universe at least throughout recorded history. In the twentieth century, great strides were made in explaining the nature of the universe and its origin. Two important theories from that century were the Big Bang theory and Inflation theory. Big Bang was the dominant model of the universe, and many observations supported it. But, some things were not easily explained by the Big Bang theory, leading to the Inflation theory modification. Today, we have many more tools than ever before to gather data about the cosmos, and some of this new information is beginning to answer our questions and is confirming many aspects of the Big Bang. In the near future, we should get even more answers. The Big Bang theory contends that all matter and energy were contained in a gravitational singularity, which was, perhaps, infinitely small. Pressure and temperature may have been infinite as well. For unknown reasons, this singularity began to expand. The Big Bang was not an explosion as the name would imply, but an expansion of space and the universe itself. At first, the universe was extremely hot, but as it began to cool, the laws of physics as we know them started to take shape. In the “intensely hot environment of the early universe,” the three non gravitational forces appear to merge together”. They cannot be distinguished from one another until the universe begins to cool from the intense heat created by the Big Bang. “In this state the universe was far more symmetric than it is today”. It is by the energy, or force, of the Big Bang that the universe evolves, or grows. But in the split seconds after the Big Bang, these particles and the energy related to them were not distinct from one another. The violence of the Big Bang would cause the universe to be asymmetrical in some respects. But in the split seconds after the Big Bang, matter was not yet so dispersed, or fragmented, that different forces of different subatomic particles were needed to hold it together. Hydrogen and helium atoms were formed and pulled together by gravity to make gas clouds, stars and galaxies. It is difficult to talk about the singularity because the laws of physics as we understand them did not apply to the singularity. For that reason, it is also difficult to talk about time before the Big Bang. In fact, time as we understand it is considered to have begun with the Big Bang. Exploration of the Solar System research papers compare the general characteristics of the terrestrial planets to those of the gas giants. Asteroids research papers discuss the difference between actual planets and asteroids - relative size. Supernova research papers examine these huge stars in the cosmos and how they are formed. Life of a Star research papers trace the formation of stars, as seen by the Hubble Space Telescope. Aurora Borealis - Research papers on aurora Borealis help explain where the northern lights came from. The Moon research papers look at the many theories astronomers have on the origin of the moon. Thermal Energy Research Papers look at the design of air conditioners and how they work. Order a research paper on thermal energy from Paper Masters. Paper Masters writes custom research papers on The Universe and look into the scientific view of the universe using astronomy and physics.